For as long as I can remember, my parents have constantly been telling me to put on some sunscreen before I went out to play…and given that these last few days have been amazingly hot and sunny in Vancouver (finally! ), I instinctively reach for it. When taking clients out for bootcamp or a run, we all have it in our bags and apply it liberally, just like we’ve been taught. But wait! 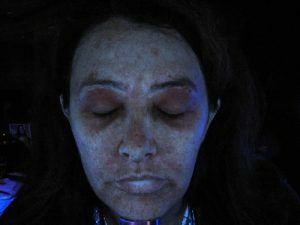 Have you noticed the rash of articles being posted that totally reject the notion of using lotion? That our sunscreen is actually CAUSING cancer? So now what? The agent its self can come in many different forms, such as a gel, cream or spray, but there are two main methods that sunscreens use to protect your skin. Chemical sunscreens work to absorb Ultra Violet light, while physical sunscreens work to reflect Ultra violet light. 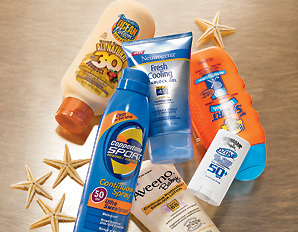 Every sunscreen is given an SPF ( Sun Protection Factor) value. This is a ratio found in a lab of how long your skin can be exposed to the sun without burning once the screen is applied (for example a sunscreen with SPF 60 will allow you to stay in the sun for 600 minutes). However, if a sun screen of SPF 30 is applied too lightly, it would only be serving the purpose of a screen with SPF 15 and therefore would not be protecting you effectively. Dermatologists recommend an SPF of 30 or higher, considering that people usually apply sunscreen in less than adequate amounts. Look for a sunscreen that is approved by the Canadian Dermatology Association and protects against both UVA (causes sun burn) and UVB rays (penetrates the superficial layer of skin and causes breakdown). How much sunscreen should I be using? Clinicians recommend the average person should use approximately enough to fill a “shot glass, “when applying sunscreen over your entire body. Take extra care to reapply sunscreen more frequently if you are swimming or performing activities where you are perspiring, as the sunscreen is often removed from the surface of your skin faster. The amount and frequency of application is more important than the actual SPF value in the sunscreen, as SPF values over 30 will only protect you 3 to 4 % more regardless of their numerical rating. Extremely cautious users avoid products that contain the chemical oxybenzone, as some studies argue that this agent will increase your risk of developing skin cancer by disrupting your hormones. The FDA claims that retinyl palmitate (a form of Vitamin A found in some sunscreens) in high doses causes the development of skin tumours and lesions, and should be avoided when purchasing sun protection. These toxins can have a disruptive effect on your body’s homeostasis. (I guarantee that you will find highly decorated doctors, with every initial behind their name arguing with each other over the validity of these studies and interpretations of the data). What is a tan? Am I really damaging myself? That beautiful bronzed layer on your birthday suit from over exposure to the sun may look great, but in reality, is a visual sign that your cells are being damaged by UVB rays of sunlight. The darkened colour is caused by melanin granules that are pushed to your skin’s surface when the DNA becomes destroyed. (1) our body’s natural genetic ability to protect itself from the sun’s environmental damage is greatly reduced due to our human evolution being pretty slow compared to speed with which we’ve caused damage to our ozone layers and thus allowing more harmful rays to reach us…but sure. (2) many people opting to use sunscreen are hoping to prevent the rapid (skin) aging process that occurs with greater exposure. So then the question becomes is beautiful skin (versus wrinkles and the leathery look) more or less important to you? There’s no right or wrong answer to this, it’s just what is more important to that person? And there’s nothing wrong with wanting youthful looking skin! So perhaps more UV protective clothing, giant hats, movie-star sunglasses and gloves are needed! Avoiding the sun during peak hours (11am – 4pm) is a great first defence against over exposure to UV light. Secondly, Wear tightly knit clothing will help to guard your skin against UV damage if you know that you will be susceptible to over exposure throughout the day. Lastly, wearing a hat and sunglasses with UVA and UVB protection will help to prevent sunburn on your scalp, and will help to prevent eyelid cancer, intraocular damage and macular degeneration. When combined with a host of other natural ingredients these oils can make for an effective sunscreen. It is also recommended to add zinc oxide or titanium oxide to help reflect the suns UV rays if you are interested in making your own sunscreen. Blend all ingredients together in a large measuring cup or bowl. Scoop into a clean, sterile container and apply to the skin as often as needed. Oh, of course the jury is still out on this issue! Everything that is good for you today, will only be discovered that it’s kind of questionable for you tomorrow. Current research shows that the ingredients oxybenzone and retinyl palmitate have been associated with cancer. Other ingredients seem to be less in the spotlight for causing hormonal disruption and therefore associated illness. If it is possible to find a sunscreen without those ingredients, (there are actually quite a few on the market, but more likely you will find them in places like Whole Foods and Choices), it might be a choice that puts your mind at ease. 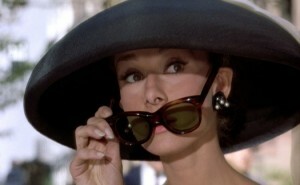 At the end of the day, limiting sun exposure, wearing a hat and sunglasses is probably the best way to go. If your motto is “live fast, leave behind a good looking corpse” (did anyone catch that reference? ), then, well, then I don’t really have any advice for that! Take up bungee jumping, perhaps? (I would just die of fright). Anyhow, chose wisely and apply liberally. Some interesting (and motivational) advice from 1997. Some things change, and some things never will. Let’s hope the great advice from this video will never be bad for you!